Transform your internship program’s record-keeping process and reduce your paper. Track your internship hours online – no paper required. Approve internship hours online with just a few clicks. is available for interns to use for job applications and more. Interns log their activities on a daily basis inside MyInternshipJournal. They’ll have access to the web-based tool as well as a handy mobile app. Interns submit hour logs to their supervisors for approval electronically. Supervisors can approve hour logs online inside MyInternshipJournal.com. At the end of the internship, online evaluations are completed by the intern and supervisor. Any other documentation can also be attached to the intern’s journal. Ask questions, schedule a live product demo, or just have a chat. © 2015 Time2Track. All rights reserved. 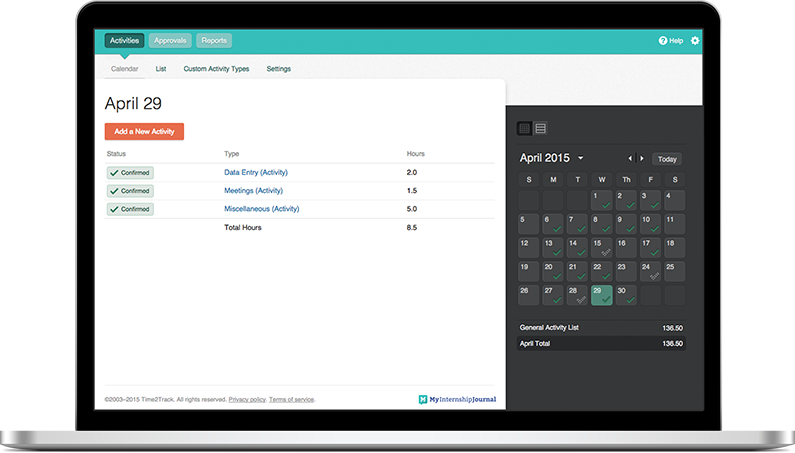 MyInternshipJournal is a product of Time2Track, the leader in clinical training hours tracking for behavioral health. Trust in our experience to take your internship program to the next level.